Sunday April 26th saw members of the St. Peter in Thanet Lodge of Mark Master Masons along with their friends and family join with Brethren, friends and family of the Bradstow Craft lodge No 2448 in their annual St. George's Day celebration lunch held at the Broadstairs Masonic Temple. After enjoying pre lunch drinks in a very congenial atmosphere the 45 diners entered the dinning room to find it gaily decorated with St. George, flags and bunting then sat down to enjoy a lunch of traditional British Roast Beef with all of the usual trimmings. The afternoon was finished with a Grand Raffle followed by a sing song of Patriotic English songs the volumn of which I am sure was aided by the pre lunch drinks. So in all a very enjoyable afternoon in the company of our brother Craft Masons all sharing the same ethos of raising money while enjoying ourselves. Thanks must go to Bro. Maurice Kennet, Charity Steward of the St. Peter in Thanet Lodge of Mark Master Masons and Bro. Reg Pritchard, Charity Steward of the Bradstow Lodge along with all those who supported the event helping to raise £200.00 towards the Kent Mark Benevolent Fund 2020 Festival. 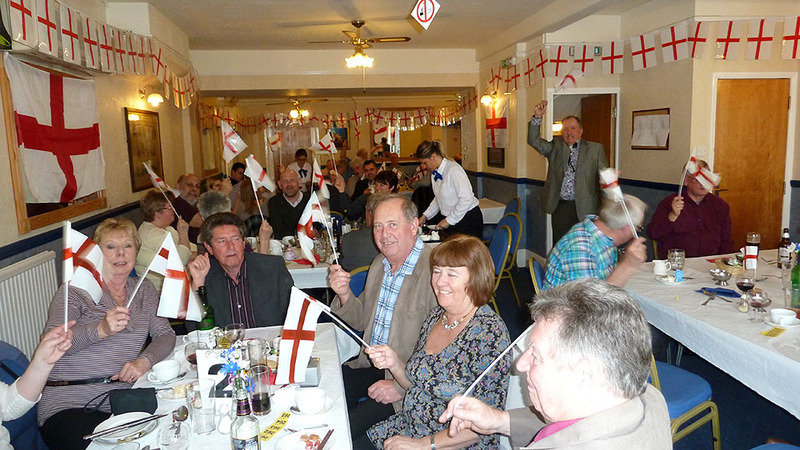 The photo shows the diners taking part in a rendition of ' Land of Hope and Glory'.